Prices declined in 12 of the 20 Case-Shiller metropolitan areas, and were flat in New York. In the Washington, DC area prices were fell -.4% (not seasonally adjusted) in October compared to September; Annually prices have declined -2.8%. I expect small price declines during over the winter months in the DC area. I'm on vacation this week. David says he'll post to the blog while I'm gone. 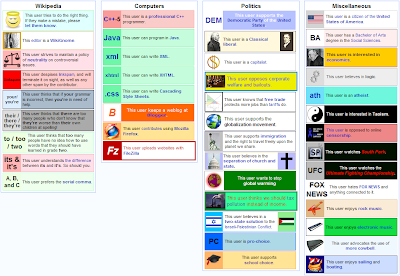 In the meantime, get to know your blogger through Wikipedia user boxes. Click on the image to see the full-sized version. 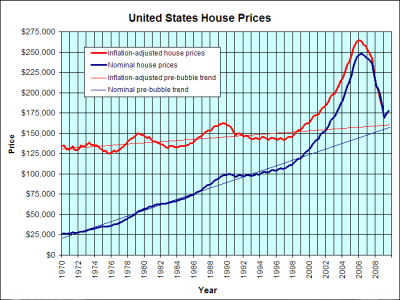 For those who are interested, I have finally gotten around to updating my housing bubble graphs. The national graph now has a new feature: pre-bubble trend lines. Click on the graph to view the full-sized version. David Lereah launches a new blog called Real Estate Economy Watch. Maybe not… but it appears that Lereah has launched a new venture… let’s call it a blog… with both an ironic title and a decidedly more realistic un-spun outlook. “Real Estate Economy Watch” is effectively a blog that hosts daily commentary on the housing market, tracks market data, and even specifically follows the course the “housing crisis”. The title is ironic because it is reminiscent of “David Lereah Watch” a popular blog that relentlessly pounded Lereah during the heyday of the bubble crescendo. The content, on the other hand, bears an unrecognizable skeptical edge. Solid name for his site. I hope that it also contains solid content. Of course he cannot be trusted. Kevin Drum criticizes Fed Chairman Ben Bernanke for being complacent about the growing housing bubble. Nobel laureate Paul Krugman follows suit. Home builders say they are unfairly targeted in the sweeping Senate health-care legislation that could mean coverage for millions of Americans. "In their rush to pass massive health care reform before Christmas, Senate Democrats included a last-minute provision overtly targeting the construction industry, including home builders," the National Association of Home Builders said in an email alert to its 200,000 members Monday. "In order to find the 60 votes needed to pass health-care reform, a provision was slipped into the health-care bill to exclude the construction industry from the small business health-care exemption contained in the bill." Employers with more than 50 employees would be required to offer insurance or pay a fine of up to $750 per employee if any employee obtains federal subsidies for coverage. But the builder group says the bill singles out the construction industry by "only giving construction firms an exemption from the bill's employer mandates if a firm employs less than five people. Every other industry is granted an exemption if they have fewer than 50 employees." Earlier today I mentioned that the Fed started using First American CoreLogic's LoanPerformance House Price Index last year for the Flow of Funds report. And also that LoanPerformance announced today that house prices fell 0.7% in October. Since most people have been following Case-Shiller, here is a graph of the LoanPerformance index (with and without foreclosures) and the Case-Shiller Composite 20 index. The LoanPerformance HPI with foreclosures is the red line, the LoanPerformance HPI without foreclosures is the blue line, and the Case-Shiller 20-city index is the green line. (The Case-Shiller index includes foreclosures.) 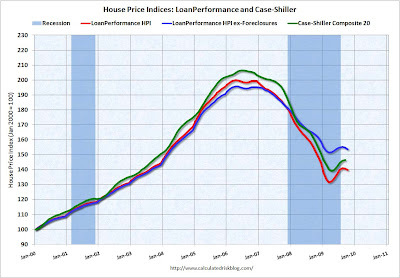 Notice that both LoanPerformance indices show falling prices again, while the Case-Shiller index is showing slowing price increases. Click on the graph to see the full-sized version. Consider this a Christmas present for bubbleheads. Finally, a stimulus bill I can support. But why does Congress feel the need to tell states how to spend the money? Why not just give money to the states and let those closer to the ground level make the spending decisions. Does Washington, D.C. really know what's good for Wyoming better than the Wyoming state legislature does? Next year "government interventions will start to disappear, shadow inventory will hit the market and mortgage rates will start to rise" to around 6 percent from under 5 percent, he said. "We're in a false state of stability." Shadow inventory includes houses that banks now hold but have yet to put up for sale. Double-digit unemployment will push more owners into foreclosure, further destabilizing the housing market and pressing prices down another 5 to 10 percent, said Flint. Foreclosures could escalate to 4 million in 2010, RealtyTrac Senior Vice president Rick Sharga said. "Unemployment, negative equity are driving factors, as is credit availability," he said. "We don't believe we will get back to normal levels of foreclosure activity on a month-to-month basis until probably the end of 2012, and we will still be going through the shadow inventory well into 2013." Banks will place the unsold homes on the market at a measured pace to thwart prices on all homes from falling off a cliff anew, he said. Do you agree with Time's choice of Ben Bernanke as Person of the Year? To paraphrase an old Paul Krugman saying, "Whom the Gods would destroy, they first put on the cover of BusinessWeek Time magazine." In an extended interview with Time Magazine, Fed Chairman Ben Bernanke says he refinanced his own mortgage a couple of months ago at 5%, and switched from a floating rate, which the Fed chairman said “exploded” in cost, to 30-year fixed. 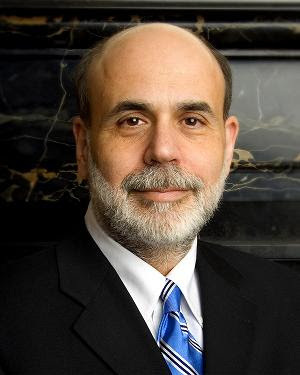 Mr. Bernanke bought a 2,600 square foot house in 2004 for $839,000. A conspiracy theorist might infer that Mr. Bernanke sees rates rising a lot in the years ahead. Why else lock in a low rate now? It’s also interesting that he had an adjustable rate mortgage whose cost exploded. Could the Fed chairman have been in an exotic mortgage with a rate that reset much higher? "We want our borrowers to have a much less stressful time, to spend their time with their families during the holidays as opposed to worrying about their homes," Sanjiv Das, head of the company's mortgage division, said in an interview. Lend America is hardly the only lender with a troubled record that Ginnie Mae has endorsed. The agency has provided taxpayer backing to at least 36 other mortgage companies with a history of reckless lending, fines or other sanctions by state and federal regulators or civil lawsuits, according to an analysis of government records, court documents and statistics in a HUD database. More than a dozen lenders with Ginnie's endorsement have made loans that are now delinquent at rates far in excess of what regulators consider acceptable. And some of these lenders have been accused of misleading both borrowers and the government about these loans. 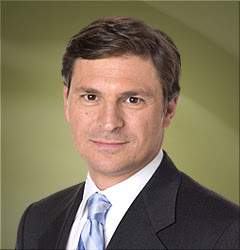 In The Bubble Decade, a one-hour CNBC Original documentary, Correspondent David Faber reports on one of the most dramatic periods in the history of America’s financial markets. As the first decade of the 21st century draws to a close, Faber looks back at the tumultuous era, one marked by ambition and innovation, avarice and excess, and record highs – and lows – on Wall Street. The sweeping story of the three economic bubbles that defined the decade begins with the tech bubble, its apex marked by AOL’s audacious takeover of Time Warner. The deal signified the heights and hope of the dot-com boom, a chapter that saw the creation of scores of high-flying internet companies, many of which would die an early death. The middle of the decade brought the housing boom and the formation of the real estate bubble. It was the age of easy money, with banks all too eager to fund new construction, and developers and homeowners all too eager to take on loans they couldn’t afford. The last bubble of the decade to burst was the credit bubble, exemplified by private equity firms awash in money and on the lookout for takeover targets. In some cases, these private equity deals and leveraged buyouts resulted in a lucky few making a fortune, with the targeted company loaded up with debt and ruined in the process. The rollercoaster ride of the past decade is told through the people who lived it: some who made millions, some who lost millions, and some who did both. Faber profiles Internet entrepreneurs, real estate speculators, and corporate takeover specialists. In addition to reporting the taped segments, Faber will moderate two panels of key players who shaped the biggest financial stories of the decade. It's hard to believe this decade is almost over. Each decade goes by faster than the last. Megan McArdle gives her thoughts. He grew obsessed with housing values and wanted to come up with a better way to measure them. Within a few years, Case and his colleague Robert J. Shiller of Yale University created what is now called the S&P/Case-Shiller Home Prices Indices, a measure based on repeat home sales that industry officials and economists rely on to gauge the health of the country’s housing market. 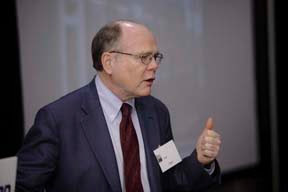 Case spun his ideas on home values into a series of papers, became one of the nation’s foremost specialists on housing, and imparted his passion to students, leading them on tours of Boston neighborhoods and requiring them to go through the process of buying a house as part of their course work. Case said he is going to keep talking about housing, even in retirement, and will work on the 10th edition of his textbook, “Principles of Economics.’’ He also plans to continue speaking at conferences. Foreclosure filings fell by 8% in November, making it the fourth consecutive month of improvement in the housing market. However, while there are signs of improvement, the industry has yet to turn around: Foreclosure filings were still a lofty 18% above November 2008's levels. The Federal Housing Administration exists in part to make housing more affordable for low-income families. However, with the advent of the financial crisis the FHA has experienced mission creep. The first of its new missions is to help prop up housing prices, thus preventing housing from becoming affordable. The second of its new missions is to help high-income Americans buy homes. Since the FHA is currently on financially shaky ground, these new missions could end up coming at taxpayer expense. Even some fairly fancy condo buildings are now trumpeting FHA financing. As the New York Times reported recently, among those buying property with little or no money down, thanks to FHA, are investors and well-off people who could have come up with more equity. ...Whatever the additional risk may be, the federal government is assuming it in a way that facilitates the upward transfer of wealth. When adopted last year, the higher FHA loan limits were billed as a temporary fillip to the housing market. But temporary subsidies have a way of enduring. ... This might help build a floor under the still-shaky housing market, as intended. But it would also complete the mission creep of the agency from one dedicated to upward mobility to one that also produces middle- and upper-middle-class enrichment. Lawmakers from high-cost housing districts, for example, want to ensure that the FHA doesn’t disappear from their neighborhoods. They’ve introduced a bill that would make permanent the higher loan limits that Congress temporarily expanded last year. ... [Barney] Frank said he thinks limits should be increased to around $800,000. ... Other lawmakers, meanwhile, want to bring back programs that allowed borrowers to receive FHA-backed loans without making down payments. A traditional rule of thumb is that the price of the house you buy should be roughly three times your annual income. (Many of the homeowners who ended up underwater recently ignored this rule of thumb, looking only at their monthly payments instead.) Using this 3X annual income ratio, an $800,000 FHA loan would allow people earning up to $266,667 per year to qualify. Using a far more generous 4X annual income ratio, people earning up to $200,000 would qualify. These income levels are way above the U.S. median. Even in America's three wealthiest counties as of 2008—Fairfax County, Virginia, Loudoun County, Virginia, and Howard County, Maryland—these income levels are at least double the median household income. So here's a question for readers: Since the FHA is knowingly offering huge mortgages with very little down payment (3.5%), and knows that such behavior led to massive defaults when banks recently did the same thing, is it morally ethically acceptable for a borrower to walk away from an FHA loan—leaving taxpayers with the bill—if he ends up underwater on his home? While it is difficult to disentangle the reasons why Canada avoided the subprime boom, some factors can be identified that may have contributed to the differences in the Canadian and U.S. subprime markets. Perhaps the simplest story is that Canada was “lucky” to be a late adopter of U.S. innovations rather than an innovator in mortgage finance. While the subprime share of the Canadian market was small, it was growing rapidly prior to the onset of the U.S. subprime crisis. In response to the U.S. crisis, some subprime lenders exited the Canadian market due to difficulties in securing funding. In addition, the Canadian government moved in July 2008 to tighten the standards for mortgage insurance required for high LTV loans originated by federally regulated financial institutions. This further limited the ability of Canadian banks to directly offer subprime-type products to borrowers. There are also several institutional details that played a role. The Canadian market lacks a counterpart to Freddie Mac and Fannie Mae, both of which played a significant role in the growth of securitization in the U.S. In addition, bank capital regulation in Canada treats off-balance sheet vehicles more strictly than the U.S., and the stricter treatment reduces the incentive for Canadian banks to move mortgage loans to off-balance sheet vehicles. Finally, as noted above, the fact that the government-mandated mortgage insurance for high LTV loans issued by Canadian banks effectively made it impossible for banks to offer certain subprime products. This likely slowed the growth of the subprime market in Canada, as nonbank intermediaries had to organically grow origination networks. The Canada-U.S. comparison suggests the low interest rate policy of the central banks in both countries contributed to the housing boom over 2001–2006 and that a relaxation of lending standards in the U.S. was the critical factor in setting the stage for the housing bust. A caveat worth emphasizing, however, is that the Canada-U.S. comparison tells us little about what would have happened if U.S. monetary policy had been tighter earlier. Tighter monetary policy in the early part of the decade may have helped to limit the subprime boom by slowing the rate of house price appreciation over 2002–2006. The Canada-U.S. comparison does, however, highlight the practical challenge facing policymakers in assessing whether a rapid run-up in asset prices is a bubble or a “sustainable” movement in market prices. Just how amazing were the US payroll numbers released on Friday? So amazing they’re verging on the (perish the thought) unbelievable, according to some analysts. The consensus forecast among analysts for the November job loss had been -130,000, with even the relatively optimistic and sometime-clairvoyant economists at Goldman Sachs forecasting -100,000. The official data showed a fall of just 11,000 — about 90 per cent fewer than the consensus estimate. Many months ago I began tracking the Automatic Data Processing payroll numbers in addition to those from the Bureau of Labor Statistics in order to satisfy those conspiracy theorist commenters who just don't trust the government's data. 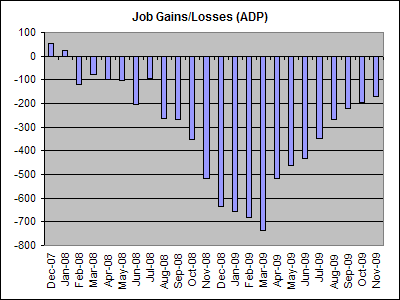 For November 2009, ADP and the BLS disagree by over 150,000 job losses. Update: I just noticed that the BLS measures both private and government payrolls while ADP only measures private payrolls. 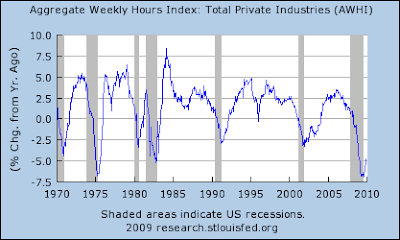 However, even just comparing private payrolls, the disparity is roughly the same. ADP says there were 169,000 private nonfarm job losses in November, while the BLS says there were only 18,000 private nonfarm job losses—a 9-fold difference. Thoughts on "too big to fail"
Economist and blogger Rebecca Wilder has some thoughts on "too big to fail" banks. The world is trapped in a global savings glut. It is both the source of our economic woes and an obstacle to the task of pulling ourselves out of the ditch. Worse yet, the glut's continued existence will feed a succession of asset bubbles until we confront it, head on, and find ways to soak up the excess. Until the savings glut is vanquished, asset bubbles and instability will be fed, exacerbating income inequality and favouring wealthy bankers and the Chinese elite. It will continue drawing resources away from productive sectors of the economy and channelling them into high-paying but socially useless financial engineering – or into yet more excess capacity. If you've ever considered going into banking, perhaps it's not too late. Real estate agents may again be raking in the dough. And Bubble Meter may continue to have plenty to blog about. Looking for an inexpensive Christmas gift for yourself or others? Just want something to read while traveling? 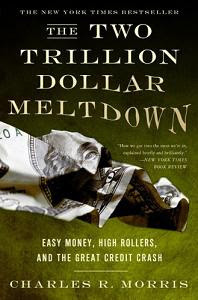 The Two Trillion Dollar Meltdown is currently available from Amazon.com for only $4.55. "Trillion Dollar Melt Down" is about the 2007 sub-prime credit crisis. The huge problem, though, is that the book mostly proclaimed that the sky was falling in 2007 when it was written, but now - (mid 2008) when the book has finally reached the market - the sky still hasn't fallen, no recession has started, and unemployment is still very low. The book, then, seems like a short (194 pages), obsolete gimmick, raced to market, to capitalize on old fears about something that never happened. 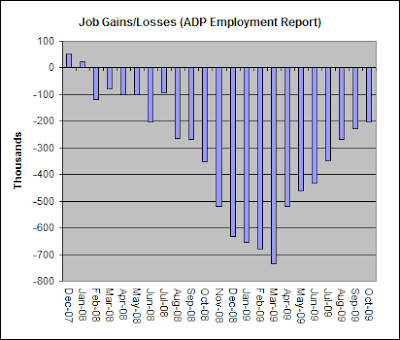 Compare the above graph with a graph of ADP's numbers. Permabears must be growling at the improving data. 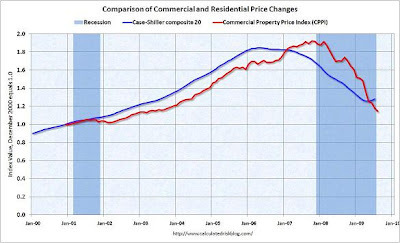 The residential housing market will dip again in mid-2010 before settling into a recovery in the back half of the year. Foreclosure inventory will be a lot higher than some predict. No more historic lows on the 30-year fixed. Commercial real estate will continue to suffer the ills of low vacancy rates, low rents and high default rates. November was the eighth consecutive month during which the decline in employment was less than in the previous month. Although overall economic activity is stabilizing, employment usually trails economic activity, so it is likely to decline for at least a few more months. Keep in mind that we need 100,000-200,000 job gains each month just to keep up with population growth. The credit had been due to lapse on Dec. 1, so many October buyers may have acted to get in under the wire. That's the incendiary core message of a new academic paper by Brent T. White, a University of Arizona law school professor, titled "Underwater and Not Walking Away: Shame, Fear and the Social Management of the Housing Crisis." Scenario #1: You walk into a bank and take a bunch of money that doesn't belong to you. This is called theft. Scenario #2: You take out a loan, promising to pay it back. Then, after you have the money, you decide not to pay it back. 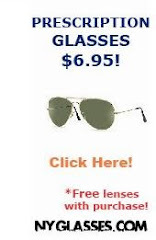 How is this not also theft? I can completely understand not paying back a loan if you lose your job and are unable to pay back the loan. I can also understand if you get sick and end up with huge medical bills that make it impossible to pay back a loan. I can even understand not paying back a loan if the bank deceived you regarding what your payments would be. However, if you decide not to pay back the loan simply because you overpaid for your house, then I consider that the moral equivalent of theft. Keep in mind that being underwater doesn't mean you can't afford the monthly payments. It just means that the value of your house has fallen by more than the amount of your down payment (and any subsequent principal payments). A person who stiffs their lender because their investment didn't turn out as expected is scum. Just because you can steal from a bank doesn't mean you should steal from a bank. Update: This is not just a moral issue. It's a practical one, too. Mortgage interest rates contain a risk premium. A society in which homeowners eagerly stiff the bank is a society in which it is riskier to lend. A society in which homeowners feel a moral obligation to repay their debts is a society in which it is less risky to lend. More risk means a higher risk premium, and thus higher interest rates. Less risk means a lower risk premium, and thus lower mortgage interest rates. Society as a whole benefits when everyone feels a moral obligation to fulfill their end of agreements. "You buy this house and you will be rich." Flashback 2005: Margaret Hwang Smith and Gary Smith said "there is no bubble"
Margaret Hwang Smith and Gary Smith, economics professors at Pomona College in Claremont, California, argued in a paper titled "Bubble, Bubble, Where’s the Housing Bubble?" 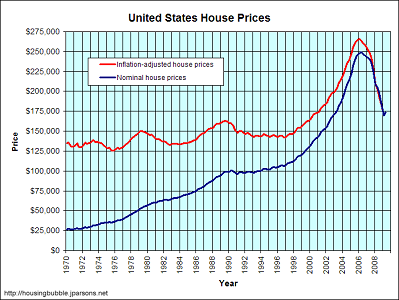 that "there is no bubble in the prices of single-family homes in 2005." In a bubble, market prices are far above fundamental values calculated with reasonable assumptions about the future cash flow. By this definition, there is no bubble in the prices of single-family homes in 2005. ... The observation that real estate prices are higher than they used to be or higher than the values predicted by models using historical prices does not prove that current prices are above fundamental values. ... The relevant question, however, is not how much prices have increased in the past or how fast people expect them to increase in the future, but whether, at current prices, a house is still a fundamentally sound investment. Our answer is generally yes, if the owner plans to stay in the area for many years to come. If housing was "still a fundamentally sound investment" near the peak of the market, then why is the federal government today trying to rescue homeowners from foreclosure? Why is the Smiths' home state of California in such an economic mess? Congratulations, Margaret Hwang Smith and Gary Smith! 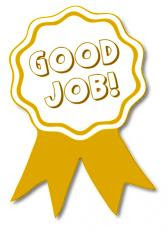 I hereby award you the James K. Glassman and Kevin A. Hassett Award for being completely unable to recognize an asset bubble. There may well be an anti-elitist strain to the anger against the Fed and Bernanke, but serious people do not dispute their responsibility for the economic crisis. There was an enormous housing bubble that was easy for competent economists to recognize. It was inevitable that it would collapse and that its collapse would lead to a serious downturn. Bernanke and the Fed allowed the bubble to just continue to expand until it collapsed of its own weight instead of using the powers of the Fed to rein it in before it grew to dangerous levels. All of this is entirely clear to those who know the history. Federal housing subsidies are insane. What last month had appeared to be third-quarter growth of 3.5% in gross domestic product turns out to have been a more modest 2.8%. Consumer spending was pared back to 2.9% from 3.4%. The cash-for-clunkers subsidy produced fewer new-vehicle purchases than first estimated. In short, we aren't getting much bang for our $787 billion stimulus bucks. The housing bubble and its aftermath arose from market distortions created by the Federal Reserve, the government backing of Fannie Mae and Freddie Mac, and the Department of Housing and Urban Development and its Federal Housing Administration. 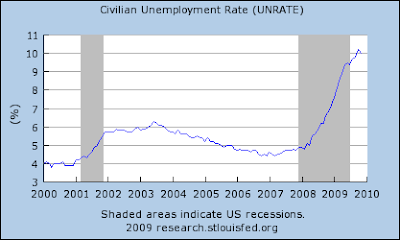 Americans suffered through a severe recession in 2008 and 2009, a downturn unfortunately precipitated by perverse government policies. Regarding bad decisions made by the private sector, the traditional remedy for severely mistaken investment policies was to shut and dismantle those firms making mistakes to stop the bleeding, to free their assets and personnel to go where they can add value, and to make room for firms with better entrepreneurial ideas. That sort of market restructuring should have been allowed to happen in the U.S. financial sector. A financial market in which failed enterprises like Freddie Mac or AIG are never shut down is like an American Idol contest in which the poorest singers never go home. The closure of Lehman Brothers (and the near-closure of Merrill Lynch), by raising the interest rate that the market charges to highly leveraged investment banks, forced Goldman Sachs and Morgan Stanley to change their business models drastically. The most effective and appropriate form of business regulation is regulation by profit and loss. The long-term remedy for the severely mistaken government monetary and regulatory policies that have produced the current financial train wreck is similar. We need to identify and undo policies that distort housing and financial markets, and dismantle failed agencies and departments, such as HUD, whose missions require them to distort markets. We should be guided by recognizing the two chief errors that have been made. First, cheap-money policies by the Federal Reserve do not produce sustainable prosperity. Second, delivering mortgage subsidies by imposing affordable housing mandates on banks and by providing federal support to Fannie Mae and Freddie Mac bonds can backfire in a tragic way that damages the broader economy. Existing home sales surged in October to the highest level in more than 2-1/2 years, according to a real estate industry report issued Monday. The gain was likely due to an influx of buyers looking to take advantage of an $8,000 tax credit that the Obama administration made available for qualified first-time home buyers, the report said. The tax credit was scheduled to expire at the end of November, but it has been extended to April 30 and expanded to include more home buyers. "Many buyers have been rushing to beat the deadline ... and similarly robust sales may be occurring in November," NAR chief economist Lawrence Yun said in a statement. But such a spike means December and early 2010 will probably see a "measurable decline before another surge in spring and early summer," Yun said. The median price of homes sold in October was $173,100, a 7.1% year-over-year drop. Distressed properties comprised 30% of the houses sold during the month. In a blow to the optimism that had surrounded the U.S. housing sector in recent months, housing starts fell a sharp 10.6% in October, the Commerce Department reported Wednesday. New construction on housing units dropped to a seasonally adjusted annual rate of 529,000, the lowest level since April. The 10.6% drop was the biggest percentage decline for starts since January. Both single-family homes and multifamily units declined last month. Prior to the October decline, housing starts have been flat for four straight months, on the heels of a big rebound earlier in the year from historic lows for the home-building industry. As you know, I don't put much stock in month-over-month changes. However, I suspect October's decline was tax credit related. Since it was uncertain in October whether the homeowner tax credit would get renewed, this may give us an idea of what to expect when the tax credit finally goes away next year (hopefully). Housing is a great long-term investment. The homebuyer tax credit makes buying a house more affordable. Homeownership is good for society because owners make better citizens. It's safe to buy a house with a very low down payment. Owning a home is cheaper than renting one because you save on rent. For his explanation of why they are myths, click here. I don't necessarily agree with all of his conclusions. When did the housing bubble begin? Why should we care when it all began? It’s politics. If the housing bubble began during the Clinton administration, it can be blamed on the Democrats and their efforts to expand homeownership to people who, in some cases, may not have been quite ready for it. If it began under George W. Bush, then it can be imputed to the Republicans’ love of deregulation. Of course, as we all know, the causes of today’s mess are far more complicated than either of those hypotheses allow. But nuance rarely figures in the debates of our age. Tom Lawler, an independent economist who worked at Fannie Mae from 1984 to 2006, says few housing gurus think the bubble began as early as 1997. In his view, the bubble began around 2002. The collapse of the tech-stock bubble in the year 2000 prompted many people, searching for other types of investments, to focus on real estate. I spotted the housing bubble in spring of 2001, so I think people who claim it began later than that are fools. Anybody who looks at Robert Shiller's graph of house prices can easily see that the uptrend in real housing prices began in 1997-1998. We were in clear bubble territory by the end of 2000. Rather than blaming it on politicians, the strongest argument coming from economists is that the bubble was caused by a global savings glut that began in the late 1990s. Update: I notice that the Edward Pinto article blames the housing bubble on the Community Reinvestment Act (CRA). For Republicans who want to blame the bubble on the CRA and for Democrats who want to blame the bubble on bank deregulation, let me point out that the housing bubble was a global event. There was/is a simultaneous housing bubble in the United States, Australia, Britain, Ireland, and Spain, to name a few countries. The CRA does not explain why there was a bubble in Spain. Also, the November, 1999, passage of the Gramm-Leach-Bliley Act does not explain why real U.S. home prices began their ascent two years earlier. The City of New London forcibly took people's homes away from them and got what in return? A field of weeds and jobs that are gone in a decade? Screw the City of New London. Following a Keynesian approach, the Obama administration has focused on restoring consumer spending. They have gone about this with a combination of near-zero interest rates, massive Fed financing of mortgages and various consumption incentives, such as rebates for new homebuyers and cash for clunkers. The Republican alternative is equally fatuous. For every problem there is a single Republican answer: tax cuts. What does Dr. Sachs propose as an alternative? A second component is a massive expansion of education spending and job training. The unemployment rate among college graduates is only 4.7 per cent, while it is 15.5 per cent among those without a high-school diploma. The US woefully under-invests in education outlays for the poor, who drop out of school and then cannot find gainful employment. A massive expansion of education and training would address the current unemployment crisis in three ways: by shrinking the numbers of young people searching for work, by building job skills for the future, and by increasing total spending in the economy through education outlays. The third component is to spur an investment boom in areas of high social return that are currently blocked by the lack of clear policies. The conversion to a low-carbon economy would create jobs in the short run, a more productive economy in the medium run, and US technological leadership in the longer run. The same is true with the overhaul of America’s ageing infrastructure at a time when cutting-edge technologies can dramatically improve the efficiency of resource use, the safety of the built environment, and the sustainability of our ecosystems. I'll let readers decide, but it seems to me that one of the most respected economists in the world agrees with me that education and infrastructure spending make for good economic stimulus, while the home buyer tax credit and cash for clunkers do not. Again, education and infrastructure spending stimulate the economy in the short run and promote long-term economic growth because they add to our country's stock of capital (both human and physical). On the other hand, the home buyer tax credit and cash for clunkers may stimulate the economy in the short run, but they subtract from long-term economic growth. Today it was clearly visible that the historical data he looks at to predict the future is not working. The current appreciation in housing and other economic indicators are not what the models would suggest. Time and time again he said “this is a time of great uncertainty.” He’s clearly puzzled by the rapid appreciation in home prices while disturbed by the “bail out economy” and the national deficit. He admitted, “Things seem to be working right now but we’re in a GRAND experiment.” I found it incredibly telling. Government has been dumping $40,000-$80,000 in cash into each marginal home purchase. With that kind of money, it would be shocking not to have a housing recovery. That spending gets added to the national debt. The people who get the hand out are often different from the people who pay the bill, so this is a case of robbing Peter to pay Paul. Also, this massive spending changes the mark-to-market (short-term) value of homes, but since it does nothing to change the owner-equivalent rents those homes generate, it does not change the discounted cash flow (long-term) value of homes. Like credit card spending, we'll still be paying the cost when the benefit is long gone. Hat tip to an anonymous blog commenter, who shall remain anonymous, and hat tip to Kevin for a link to the video. Fannie Mae, the federally controlled mortgage finance giant, said Thursday it lost $19 billion in the third quarter and had submitted a request to the Treasury Department for $15 billion in more aid to stay afloat. District-based Fannie Mae and its McLean sibling, Freddie Mac, were seized in early September 2008 by the federal government. Since then, Fannie Mae has lost $111 billion. The $15 billion in aid it has requested comes on top of $45 billion it already received. Freddie Mac has received $51 billion in aid. In total, the seizure of Fannie Mae and Freddie Mac has cost taxpayers $121 billion, among the costliest of the government's interventions to stabilize the financial markets. In its earnings statement, Fannie Mae said its assistance to struggling homeowners "could adversely affect our economic returns, possibly significantly." Freddie Mac said it didn't need any additional federal aid for the second straight quarter as it reported a loss of $6.3 billion for the third quarter on Friday. But the company said it expected to ask for more handouts from the U.S. Treasury in the future as rising unemployment and falling home prices continue to drive higher credit-related losses for both Freddie and its larger rival, Fannie Mae. The government really didn't have much choice but to take control of Fannie and Freddie when they were teetering on collapse. However, government didn't have to keep these failed companies operational. The loses they will endure for continuing to lend during a declining housing bubble can be justly blamed on the politicians. 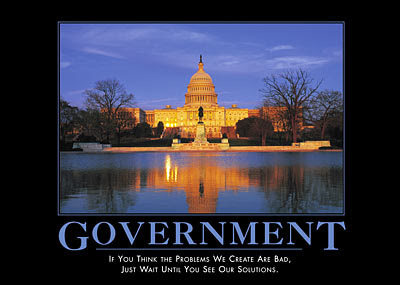 The government should simply shut down Fannie Mae, Freddie Mac, and AIG. There's no good reason to keep these failed companies in business. To put the costs in perspective, $121 billion in losses divided by 105 million American households means that these two companies have cost your household roughly $1,150. As I'm sure you've heard, Congress and President Obama renewed the home buyer tax credit on Friday. It's a massive waste of money that will simply add to the national debt. Unlike infrastructure spending, which will enhance long-term growth while helping to bail the country out of its current financial mess, spending $40,000+ each just to transfer existing houses from one person to another will harm long-term economic growth. It will harm economic growth because the government is not getting anything substantive in return for its spending and because it will have to pay perpetual interest on that deficit spending. Politicians in Washington are desperate to show that they're doing something about jobs. Unfortunately, what they're proposing to do is to spend a lot of money that they don't have in ways that won't work to help too many people who are neither desperate nor deserving. Topping the list of idiotic ideas is the bipartisan push to reinflate the housing bubble by not only extending the tax credit for struggling first-time home buyers for six months but also expanding it to another "neglected corner of human misery," as the Heritage Foundation's Ron Utt so aptly put it -- affluent homeowners who want to trade their current places for something better. It is disappointing enough that President Obama and his team of crackerjack economic advisers have not had the wisdom or courage to oppose what any first-year graduate student would recognize as truly lousy policy. But perhaps that's because the Panderer in Chief is himself knee deep in stimulus hokum of his own with his proposal to shower Social Security recipients with a $250 cost-of-living increase this year even though their cost of living has actually declined. At a cost of $14 billion in borrowed money, it's a grossly inefficient way to stimulate the economy, create jobs or even boost consumer confidence. 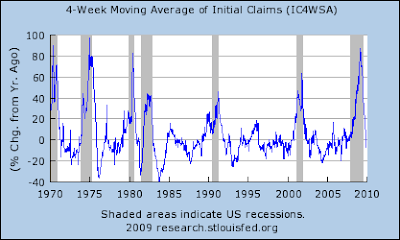 Initial weekly unemployment insurance claims continue to improve—or more precisely, they are getting worse at a slower rate. This graph shows year-over-year numbers. Ideally, we'd like the YoY numbers to be below zero for an extended period of time. 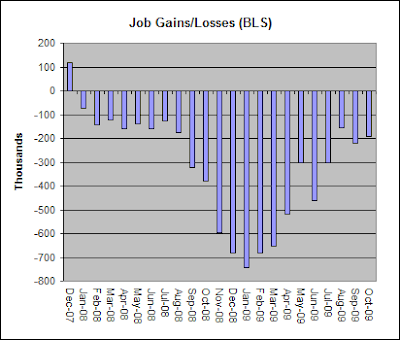 The government's job loss numbers show a continuing, but slowing, contraction in the job market. 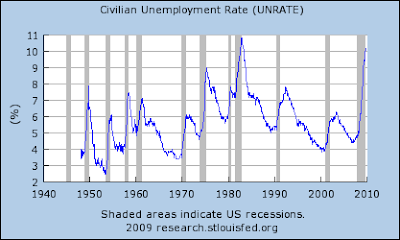 Remember, we need monthly job gains of 100,000-200,000 just to keep up with population growth. 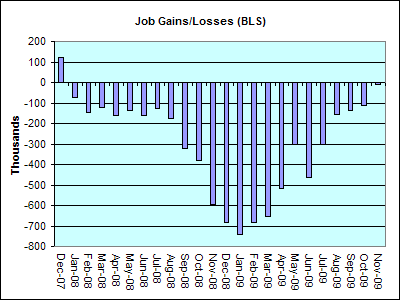 For conspiracy theorists who don't believe the government's numbers, here are the monthly job loss numbers as measured by Automatic Data Processing, Inc. Readers, how will these job numbers affect foreclosures and home prices? ENVIRONMENTALISTS who are worried about global warming should pay attention to the congressional debate about extending the home buyers tax credit. Federal tax policies toward housing have long encouraged Americans to emit more carbon. President Obama could do the country, and the planet, a service by either refusing to sign the extension of the $8,000 credit or by insisting that it be accompanied by offsetting reductions in the home mortgage interest deduction. According to the Residential Energy Consumption Survey, per person energy use in owner-occupied housing is 39 percent higher than in rental units. Energy use, per household member, is 49 percent higher in single-family detached houses than in apartments in buildings with more than five units. These differences reflect the strong connection between home size and energy use. The average four-bedroom house consumes 72 percent more electricity than the average two-bedroom house. Yet the tax code encourages Americans to live in big, energy-guzzling homes, instead of thrifty apartments, and Congress seems intent on further unbalancing the federal budget to egg on home buyers. Stupid stuff like this is why, after a decade of voting straight Democratic in state and federal elections, I decided to stay home yesterday and let the winds of change blow. I'm disgusted with both political parties. Here's an interesting look at how our little housing bubble may change macroeconomic theory. "We could be looking at a paradigm shift," says Frederic Mishkin, a former Federal Reserve governor now at Columbia University. That shift could change the way central bankers do their job, possibly leading them to wade more deeply into markets. They could, for example, place greater emphasis on the amount of borrowing in the economy, rather than just the interest rates at which borrowing is done. In boom times, that could lead them to restrict how much money various players, ranging from hedge funds to home buyers, can borrow. The number of Washington area homeowners in foreclosure has more that doubled in the past year, according to a report to be released Wednesday that shows the problem remains most acute in a few counties and could get worse as more borrowers fall behind on their payments. About 2.7 percent of local borrowers are in the foreclosure process, meaning that the bank has started the legal process to take back the property, according to the report by the Urban Institute, a nonprofit policy research group based in Washington. That was slightly below the national average of 2.9 percent. But the problem is far worse in three counties: Prince George's, where 5.2 percent of borrowers are in foreclosure; Charles with 3.9 percent; and Prince William with 3.7 percent. These areas had high concentrations of minority borrowers who were more likely to take out subprime loans, according to the report. Note that what's good for car dealers is not necessarily what's good for the overall economy, just as what's good for Realtors is not necessarily what's good for the overall economy. Like the first-time home buyer tax credit, Cash for Clunkers is nothing more than wasteful corporate welfare. The White House has come out with a weak, short-term-oriented defense of the program. Notice, however, that for the most part the left-wing economics bloggers who are usually quick to defend the White House against faulty economic reasoning (e.g. 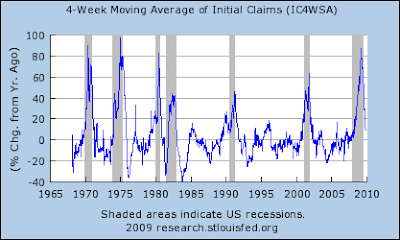 Paul Krugman, Mark Thoma, Calculated Risk) are remaining silent on this one. In fact, left-leaning economist Jeffrey Sachs is out with his own criticism of Cash for Clunkers' supposed climate benefits. Sachs actually makes the mistake of measuring total cost, rather than marginal cost, so the program is actually 5.5 times more wasteful than the numbers he complains about. Just like the first-time home buyer tax credit, Cash for Clunkers is a handout of our tax money to the special interests who lobby Congress. What does a median-priced house look like? The median price of a house in the United States is roughly $175,000. Here's what a house at that price looks like in different parts of the country. The story about shoddy construction during the boom isn’t just a NYC tale. As M.P. McQueen reported in the Journal this summer, the furious pace of home building from the late 1990s through the first half of this decade contributed to a surge in defects. It caused shortages of both skilled construction workers and quality materials. Many municipalities also fell behind inspecting and certifying new homes. The sheer volume of new buildings that went up during the condo construction boom is the main reason for the increase in defective buildings, lawyers and engineers told the Times. So one would expect to see more problems in other cities that experienced a condo boom recently. I doubt this is just a condo problem. It's something I've worried about when I eventually buy a home. So many homes were built during the boom, I bet many of them were rushed. I also bet that the increased demand for construction workers during the boom led to a drop in the average skill of the people hired to do the work, with many of them unable to even speak English. On the whole, houses built during this decade may be of inferior quality to houses built previously. Mammoth purchases of mortgage securities by the Federal Reserve appear to have held home mortgage rates about 0.30 percentage point lower than they would have been, Goldman says. Those purchases are due to be phased out in next year’s first quarter. Based on Goldman's estimates, the first-time home buyer tax credit probably cost around $80,000 per additional home sold. Ouch. Forget Wall Street, I think Congress needs a salary cut. Apparently CNNMoney.com staff reporter David Goldman wants his pay cut, too. My advice to Time Warner is go ahead, be generous, give the guy what he wants. The National Association of Realtors says about 2 million new buyers will take advantage of the subsidy this year, but the real-estate lobbying group admits that the vast majority of those buyers would have bought a home without any subsidy. Most of the subsidy is wasted. ... It's expensive, but the worst thing about the subsidy is that it doesn't address the issue of oversupply, which is the main reason prices have fallen so much. Most first-time buyers move from renting to owning a house. That subtracts one home from the vacancy list, but adds an apartment. The net change is zero. There is little gain for the economy. The tax credit is designed so a buyer can use it for a down payment. Combined with another flawed government plan to recreate subprime lending inside the Federal Housing Administration, the tax credit encourages more buyers to put less of their own money down. The one thing we know about foreclosures is that they are much more likely if the owner has no equity. So the tax credit, which was designed to reduce foreclosures by helping to prop up prices, actually will lead to more defaults as already stretched buyers lose their jobs. Remember, the first-time home buyer tax credit is costing $43,000 for every extra home sold. That's a massive waste of your money just to transfer an existing home from one person to another. The nation’s top housing official expressed doubt over the need to extend the $8,000 tax credit for first-time home buyers, and said that the Obama administration was reviewing whether the additional cost of extending the credit was worth any benefit in home sales. Shaun Donovan, the secretary of the Department of Housing and Urban Development, told a Senate hearing on Tuesday that there was “clear evidence” that the tax credit had benefited the housing market. But he said that the “real issue” in considering an extension was whether an extension was worth the cost to the government in lost tax revenue. Here is the math: 1.9 million buyers qualify for the credit (the NAR estimates between 1.8 and 2.0 million) = $15.2 billion. The NAR estimates the tax credit resulted in 350 thousand additional purchases. So divide $15.2 billion by 350 thousand = $43,000 per additional home. And the numbers will get worse if the program is extended. The Internal Revenue Service is examining more than 100,000 suspicious claims for the first-time home-buyer tax break, another sign of potential trouble for the soon-to-expire program. It's a waste of money, poor economics, and vulnerable to tax fraud, so of course Congress will renew it. The Federal Housing Administration may be under-equipped to manage its exploding market share, according to an internal audit released last week. The report gave the FHA poor marks for its steps to screen lenders that are allowed to sell loans backed by the federal agency. Some in Congress want the agency to do more by increasing minimum down payments to 5%, up from the current 3.5%. The agency says that such a move would kill any nascent housing recovery. Things are really messed up when 5% down payments would "kill any nascent housing recovery." 20% down payments used to be the norm. Is America really that addicted to debt? Breakin' the law in D.C.! The Heenes may have violated FAA regulations barring people from flying balloons or kites within 5 miles of an airport, an FAA official said. Has anyone ever noticed the annual kite festival on the National Mall? That's only 2 miles from Reagan National Airport by my measurement. Somebody please arrest the Smithsonian Institution! Have FAA officials never been to D.C.? "…within 5 miles of the boundary of any airport…No person may operate an unshielded moored balloon or kite more than 150 feet above the surface of the earth unless…"
So, if you let go of your kite at the festival and it flies up 150 feet above the earth, then you're a malefactor. In the past, Fiserv anticipated the rapid decline in home-sale prices over the past few years — though it underestimated the scope. Brad Hunter, chief economist for Metrostudy, which provides housing market information to the industry, ... pointed out that the tax credit for first-time home buyers helped support prices during the three months of Case-Shiller gains. ... But the market assistance ends when the credit expires on Dec. 1. Hunter also sees a new wave of foreclosure problems coming from higher priced loans and prime mortgages. With winter coming, Miami is about to start looking better and better. Note that commercial real estate prices aren't getting subsidized via the first-time home buyer tax credit. As far as I'm aware, they don't qualify for FHA loans either.